White, 1-inch, rallies, disk-like flowers with many petals bloom March through August, depending on latitude and elevation. Petals are sometimes tinged pink. 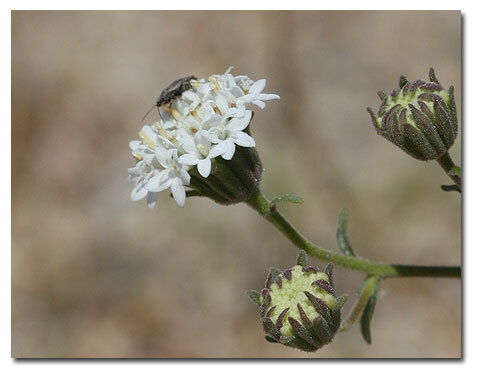 Each floret produces a seed-like fruit with papery scales. Members of the Sunflower Family (Compositae). Pincushion flowers are common spring wildflowers throughout the North American deserts. These green, erect annuals are so named because they have discoid, rayless flower heads resembling the shape of a pincushion. All four of the North American deserts throughout California, Utah, Nevada, Arizona New Mexico, and northern Mexico. Rocky, gravely mesas and plains between 1,000 and 6,500 feet. Desert Pincushion is a small, open plant that grows up to one foot high. 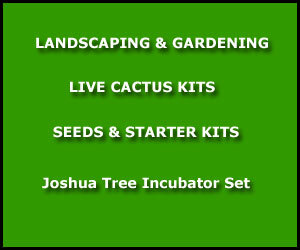 It has fuzzy, 1/2 to 1-1/2 inch long leaves that are divided into short, narrow lobes. Atop the hairy flower stems, the flowers within each head vary in size, with the outside usually being markedly larger than the center ones. Fremont's Pincushion (C. fremontii) grows slightly larger to 16 inches tall. Mojave Pincushion (C. xantiana and C. marcantha) smaller and less hairy. 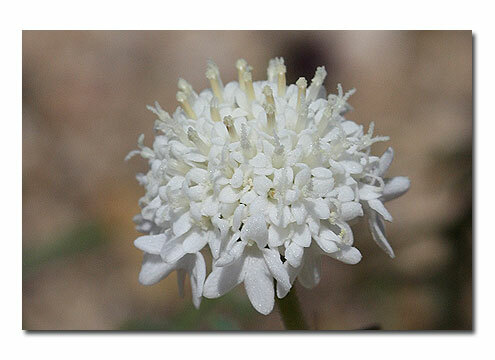 Douglas' Pincushion (C. douglasii) grows throughout desert mountains. Parish's Chaenactis (C. parishii) grows in northern Baja, California. Pebble Pincushion (C. carphoclinia) grows on dry bajadas. Yellow Pincushion (C. glabriuscula) has yellow flowers. Newsletter -- We send articles on hiking, camping and places to explore, as well as animals, wildflower reports, plant information and much more. Sign up now (It's Free).